At HPUMC, we strive to offer something for everyone in an effort to bring you closer to Jesus Christ through music and worship. You'll find traditional worship with the Dobson pipe organ, our chancel and youth choirs, and dynamic preaching in our Sanctuary. If you enjoy more contemporary praise and worship music, you'll want to check out our Cornerstone service in Wesley Hall. Our teaching service, Kerygma, offers an extended and in-depth exploration of Scripture or core Christian teaching utilizing the very best in modern scholarship. Our early Cox Chapel and Upper Room services offer music, word, and communion woven together to create an active liturgical community, assured to restore your soul. The Chapel service offers acoustic worship and preaching with an in-depth look at Scripture and blend of traditional and contemporary styles. And, our Munger Place Church campus provides a rich combination of contemporary praise and worship music in a historic church setting. 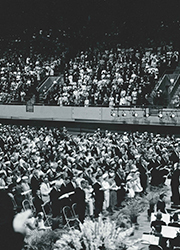 In 1957, Southern Methodist University agreed to open their new field house, Moody Coliseum, to HPUMC. The move was initially meant to be a temporary measure, until the larger sanctuary could be built. 10,000 members and visitors would fill the coliseum. Prior to 1969, worship services had been scheduled at 8:30 am in Cox Chapel with communion each Sunday, and 9:30 am and 11:00 am worship services in the Sanctuary. 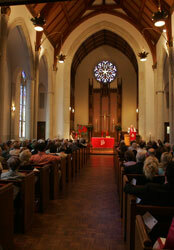 Thirteen months after the vote, an additional service was added in Cox Chapel, at the same time as one of the main Sanctuary services. This concurrent service was an attempt to respond to the needs of one of the largest sub-congregations within the total membership, in particular, younger persons and those associated with the SMU campus. It began in April 1970, and was called a "contemporary" service. 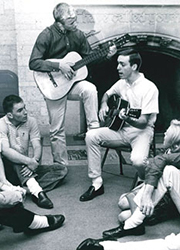 It was led by Dr. Grady Hardin, who was then professor of preaching at Perkins School of Theology, and John Erickson, who was responsible for the music leadership. The first Cornerstone service was led by Rev. Mark Craig and Rev. Rebecca Frank in April 2000. The word 'Kerygma' in the New Testament refers both to the essential core of the faith and its proclamation. An extended and in-depth exploration of scripture or core Christian teaching is shared to help participants understand what the scriptures and the teachings of the church meant in their original context and how they might be applied to lives today. On October 1, in Great Hall, Rev. Walt Marcum taught the first Kerygma class. 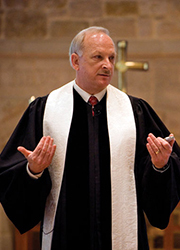 Marcum preached from the Book of John. Telling the story of HPUMC in an interactive and engaging new way.